All day, every day, digital networks around the world watch the earth's slightest movements and report them to Web servers. Want to see where the biggest quakes have been this week? Follow a few of the links below to see what's shaking in your neighborhood and around the world. While you're at it, stop a moment and think about how important these sites are for seismologists. These Internet pages and the data associated with them allow scientists all over the globe to share information immediately and accurately. The advent of the Web has dramatically improved seismology. The USGS has many maps of live earthquake data. 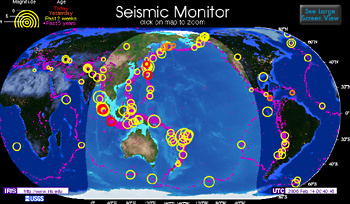 This section lets visitors see quakes that have occurred anywhere in the world in the last week. You can also focus on geographic regions. Zooming in to a specific quake, you reach a page with specific data and links to the area's seimic and quake damage history. 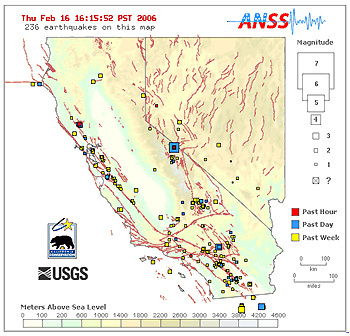 IRIS (Incorporated Research Institutions for Seismology) has developed their Seismic Monitor that offers data about quake in near realtime, lets you search the Web for information about them, and view seismograms. Recorded by stations in the Northern California Seismic Network, these seismograms update every 5 minutes. The site also includes information on interpreting seismograms and examples of different magnitudes. These maps are nice illustrations of the fact that earthquakes occur along faults. 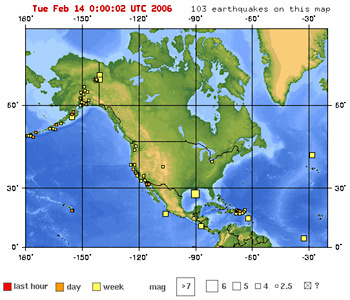 You can click the small boxes to zoom in and get more details on specific quakes. 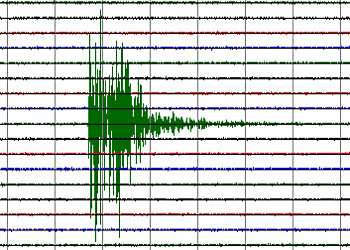 Seismometers can measure shaking, but how much does that reflect what people actually feel? 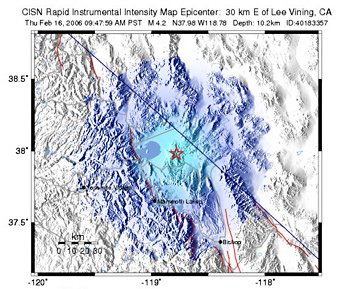 On this site, people in the area of a quake can report their experiences to the USGS, and the results are made into a map. 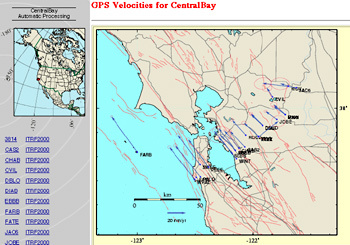 This can be compared with other shake maps for the same quake that were generated from seismometer data. USGS keeps many stations that track movements of the earth's plates using GPS. Because plate movement is fairly slow, the data are recorded over long periods of time. So the information on this site records events in the last year, or last decade, rather than the last week.